As you can see, I am squeezing every penny’s worth of value out of my parents’ tuition money. Sharp-eyed The Readers will notice that the image of Awkward Pew is taken from a DVR recording. Massively with-it member of the young generation that I am, this was achieved via the highly technical process of aiming my camera phone at the television screen. I have been taking all C-SPAN has had to give this week, for I am a complete pomp and circumstance whore. If there’s a procession, rifles, uncomfortable shoes, music nobody can sing properly, and big wide doors for people in uniforms to hold open, I will show up and I will be deeply moved. It could be the Opening Ceremonies of the Olympics. It could be Opening Ceremonies of a new Kroger’s in Avondale. I’m there with my camera. “I was thinking how stuffy it seemed,” someone commented regarding all the casket-carrying and slow-walking. “Stuffy is the glue of the Republic, my friend,” I typed back, as I launched into yet another snack-pause, but the more I reflect on it, the truer it is. I consider George Washington our greatest President because he is perhaps the first leader in the history of man to willingly and quietly turn over the reins of power in a measured and peaceful manner– this when he could have easily been President for life, if he so wished, installing policy buddies to carry on his politics long after life left him. But the construction of the White House was beginning at the end of his second term, and he probably didn’t want the hassle of applying for an EZPass. 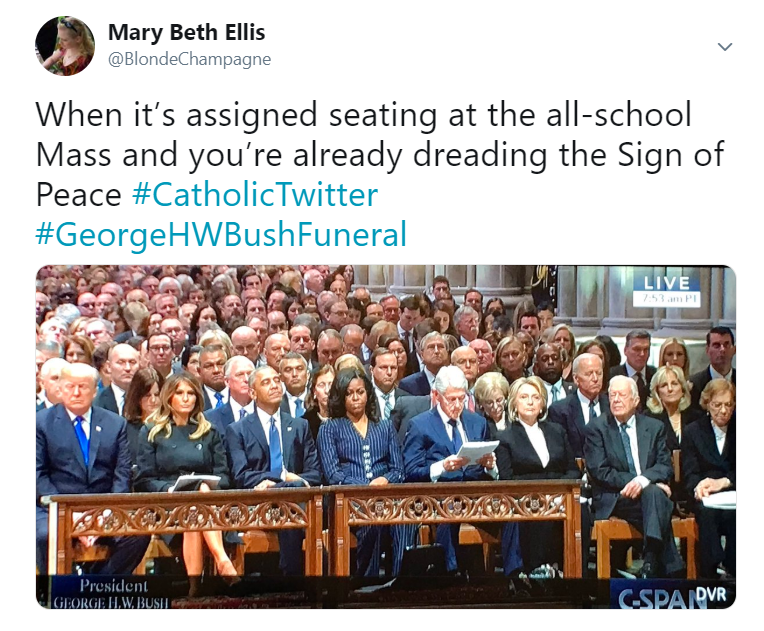 So when we see four former Presidents, plus the current occupant, all lined up together like this, even though you can practically see the hate rays waving out of their bodies towards one another, they sit there anyway. Even though it’s awkward. Even though, as I avidly kept expecting, the church roof was liable to cave in at any moment on the lot of them. Even though they were, in effect, watching their own future funerals. The flags, the measured cadences, the military bands: These rituals are expected and “normal” at such a time, and because we expect them, and because we saw them the last time a President dies and will see them again when the next one does, they are soothing. They remind us that though the leader passes, even though long out of office, the Republic continues. 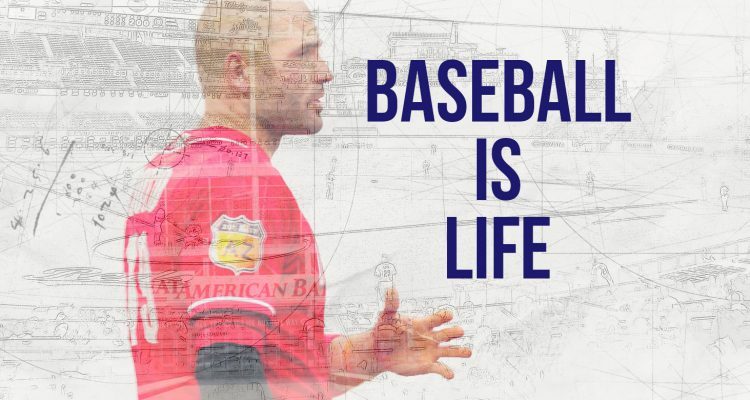 This is the comfort we find in sports, and in baseball in particular, which has been our companion in this fashion longer than any other: There’s a National Anthem, and then the first pitch, and then the players are introduced, and then they play, and then we feel despair and wonder where the playoffs went. But it’s a comfortable rhythm, one which resets each day with each game, and disrupting the pattern signals a not-quite-rightness that ripples across class, creed, and race. And for the most part, the ritual of the game is the same from the Rookie leagues all the way to the Show. It’s a comfort that we should revel in, not just take for granted. Our rituals mark our time. That’s a good thing. My return to “normal” after 9/11 was the annual golf outing at a course near the Grand Rapids airport. All of the sudden, there were planes in the sky again. It was such an odd and solemn time. ThatÃ¢â‚¬â„¢s awesome! The Bushes truly are a baseball family. The closest I ever got to Mile High was lunch at a McDonalds across the street from it. I just remember row on row of orange seats. The OpEd piece by former President Clinton last Saturday morning in the Washington Post talked about the note 41 left him in the Oval Office. There’s a rich tradition that had incredible meaning. I think I remember Reagan leaving Bush a few acorns to feed the squirrels on the balcony outside the Oval. It is amazing to me that the some of the same “news” people that were so harsh to him while he was in office had such kind words for Bush 41. That was the way it was with Reagan and will probably be for the four in the picture you snapped. It is sad that it takes a death for people to remember the good a person did and come together. 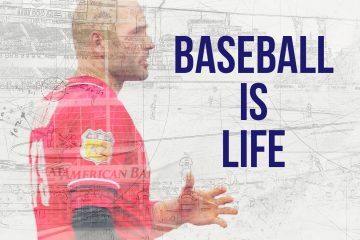 But that is one of the great things about baseball, it can bring people together who are on opposite poles of political, religious or other views and they can enjoy one another company and talk peacefully. I am for more baseball and less politics. Good article as always Mary Beth. Many thanks. I hope baseball remains as apolitical as possible for this very reason. It is hard not to like a President who also had baseball running through his veins. I have read and heard many stories of him as a 1B at Yale and his love of the game. He was in Cincinnati for a Opening Day and hosted the last Reds World Series champions at the White House. So there was a nice, small Cincinnati – Bush 41 relationship to look back upon. There was the Bush family involvement with the Texas Rangers as part owners. Bush 41 and Barbara were often seen at Houston Astros games over the years. Carter and Rosalynn were somewhat Braves fans. Bush 43 and Laura are big baseball fans. The Clintons are not seen as much of baseball fans. Obama and Michelle are also not seen as much of baseball fans, but are more into the basketball. Obama was big on March Madness. 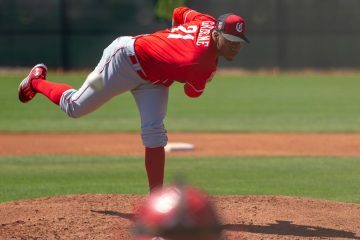 He did throw out the first pitch for the Nationals once or twice. Gladly, he didn’t look like that former Cincinnati Mayor who once infamously threw out the first pitch. Thanks for reminding of the small Reds – Bush 41 connection. “that former Cincinnati Mayor ” does not equal Sean Casey. Not that mayor. Mallory, and that was the most pathetic display I’ve seen for a first pitch. 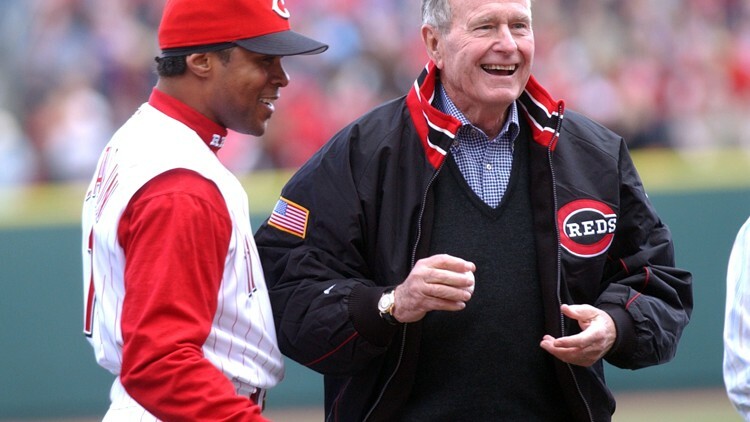 George W. BUSH 43 also threw out a 1st pitch at a Reds opening day. I had fantastic seats but man I was sick as a dog and the weather was Cincy awful.